Help us to give a great life to thousands of UK rescue dogs. So far, our work has resulted in 53492 homeless dogs getting new, permanent, loving homes through the 617 shelters who use dogsblog.com. Can you help us carry on this vital work? Your donations go toward one goal and one goal only – helping homeless dogs to find new homes through responsible adoption. Please support us. Any contribution is welcome and it really, really does help us to help thousands of dogs. Fudge is a 3-4 year old Staffordshire Bull Terrier who found himself in the care of the RSPCA Cheshire (Altrincham) because he was struggling to cope in a noisy family home with three young children. Fudge’s rescue shared his details with dogsblog.com on 17th July and he was rehomed on 28th July with Tom Strutt and Ann Brown, who found him on dogsblog.com. The couple were looking to adopt a dog after they had recently lost their dog, Ben to cancer. 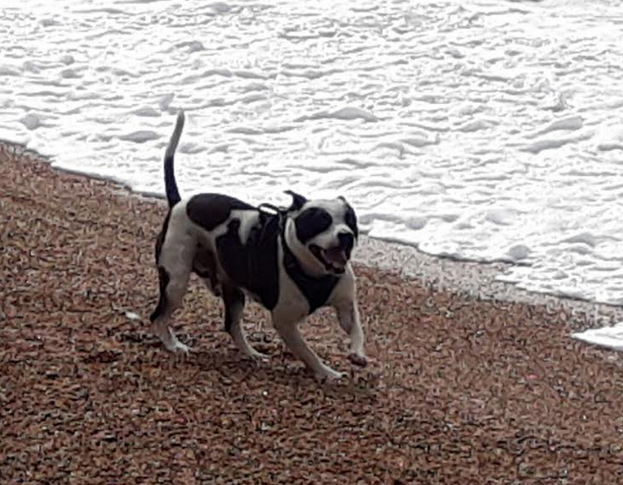 Ann says, “The house felt empty without a dog so we decided to look online for another Staffie, a rescue one this time. There are so many wanting homes, they have been given a bad reputation but nearly all the ones we see are gentle and loving and so loyal. “We saw Fudge online and he looked so happy, like all Staffies do. We drove four and a half hours to Manchester to see him at his foster home we were so pleased with him we brought him home with us. Just look at his wonderful new life! Fudge’s happiness is his way of saying thank you. Our sole focus is on helping dogs find new homes as fast as possible. We work with hundreds of rescues, charities and rehoming organisations and we pour everything in to finding the right home for as many dogs as possible as quickly as possible. That’s it. We don’t do politics, we don’t do anything other than focus on the practical side of getting dogs out of shelter and in to new homes. We rely on the support of our commercial sponsors to fund initiatives through dogsblog.com, to build media awareness about the benefits of dog adoption and to conduct large-scale outreach campaigns designed to match the right dog with the right new owner. This is expensive work. Imagine a world in which we didn’t exist. That’s 53492 dogs that could still be in rescue or may even have been put to sleep. If you are thinking of donating to dogsblog.com please know this: ALL money received goes toward ONE aim. Finding homes for dogs who need them. Not buying food for them, not buying toys for them JUST finding them a new home.